In every case, Remington prints are reproductions. The word "print" or "original print" generally refers to paper that has had a design imprinted on it by some inked medium, such as stone, wood or metal. The design is created by hand by the artist on the medium. The medium is then inked and transferred onto paper by running paper and the inked medium together through a press. Surprisingly, the true definition of the word "print" does not apply here. Collier's and the other publishers did not sell "prints." They sold reproductions of the original. If they were indeed original prints, the design would have been created on the printing medium (a wood block or metal plate) by Remington. Frederic Remington was not a printmaker. Instead, Remington's original was reproduced by staff at the publisher. Illustrations and prints became an important part of Remington's fame and popularity with the American public. Throughout the 1890s, Remington was well known in American households as an illustrator of the Old West and military subjects. His interest on the details of his human and equine subjects conveyed authenticity, though he worked in his studios in the East. Aside from his year outside of Peabody, Kansas, he spent only about three years total on western trips. Remington collected thousands of photographs, both commercial photos and ones he took himself, as visual notes. He filled his New Rochelle, NY studio with Indian, cowboy and military artifacts in great numbers. He filled sketchbooks wherever he went. Remington was a very hard worker � he spent part of every day in his studio. His drafting skills were modest when he started illustrating, but his combined talent and determination brought fluid proficiency and then greatness. Beyond his reliance on props, notes and photographs, Remington was also blessed with a keen visual memory. He had a knack for creating compositions that worked artistically and contributed to the viewers' feeling that they are 'really there', when in fact, Remington created each scene wholecloth. Wood engraving: a. A block of wood on whose surface a design for printing is engraved across the end grain. b. A print made from a wood engraving. Remington's illustrations were reproduced this way in books and magazines through the 1880s. Half tone : A picture in which the gradations of light are obtained by the relative darkness and density of tiny dots produced by photographing the subject through a fine screen. Photogravure: Any of various processes, based on photography, by which an engraving is formed on a metal plate, from which ink reproductions are made. Graver, or Burin - A tool used in engraving metal, wood, or stone. A knob-like wooden handle which holds a metal shaft having a sharp beveled point with one size of several possible shapes, either flat, round, multiple, or elliptical. It is generally designed to be pushed by the hand. Gouache - A heavy, opaque watercolor paint, producing a less wet-appearing and more strongly colored picture than ordinary watercolor. Also, any painting produced with gouache. Wash: A painting on paper made with a wetted brush dipped in India ink. Though he died at 48, Remington produced over 3,000 signed flat works. As an illustrator, Remington made thousands of artworks � often en grisaille (in black and white oil on canvas), ink wash, and gouache � that were reproduced with magazine and book text. It was the massive exposure in magazine pages that launched his fame. 1. Remington made an original drawing or painting in black and white. 2. Remington submitted the original artwork to the magazine where anonymous engravers COPIED Remington's original. Using a small, sharp metal tool called a burin, the engravers recreated the mirror image of Remington's drawing on a wood block or onto a metal plate. 3. The wood block or metal plate of the illustration was matched up with the text of the article or book. 4. The plate or woodblock � containing both picture and words was covered with ink and run through a printing press to transfer the image onto paper. 5. This process was repeated thousands of times to print an edition of a magazine or a publication of a book. The effect of the process results in a printed illustration that looks remarkably like Remington's drawing. The engravers adeptly created shapes and shades of gray and black by making hundreds of carved lines with their sharp tools. When Remington worked en grisaille, the engravers didn't have to guess what shade of gray to translate each color. Thus paintings en grisaille left less room for the anonymous engravers at the magazine to interpret Remington's original. As far as Remington was concerned, the fewer decisions the engravers had to make, the better. By about 1890, this process was abandoned when the halftone process was instituted. In halftone printing, there are no engravers to interpret the artist's intent. The original art is photographed through a fine screen, and the image becomes a pattern of fine dots of different densities, which the eye interprets as the forms. Remington continued to create original work for halftones in black and white. 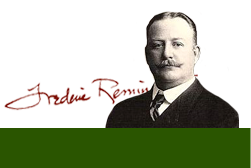 Frederic Remington's fame burst off the magazine pages by the time he signed a contract with Collier's Magazine in 1902. He agreed to provide them with a color painting per month at the commanding price of $1,000.00 each. In each case, Collier's would print the painting as a color halftone in the magazine, usually as a two-page centerfold. Unlike the previous illustration work he did for Harper's Weekly, Harper's Monthly, The Century, Scribner's, etc., Remington was free to paint whatever he wanted. His images were no longer tied to text. Remington created most of the paintings Collier's in colored oil paint on canvases that were approximately 27 x 40". Instead of a single, black ink printing, the color half tones were made with a multiple screen process, and each image was created with four sets of halftone dot patterns: black, red, blue, and yellow. These were more crude in their effect than four-color halftone prints today, but they represented a great leap forward in reproduction at the turn of the last century. These Remington images for Collier's not only set Remington's artistic choices free of reference to text, the magazine's production of prints to compliment the in-magazine images brought Remington's published art from the bookshelf to the wall in a big way. By far, the Collier's prints are the most numerous Remington prints. They were offered in the magazine by mail order for about $1.00 each, and often re-printed in different sizes, also grouped in folios with titles such as "Remington's Four Best Paintings." Many were marketed as "Artist's Proofs," a term that suggests that there was something extra-special or limited about them. It suggests that these were prints pulled first from the press for Remington's approval. The "Artist's Proof" tags carried a simulated Remington signature, which still baffles optimistic flea-marketers today. Do you own one of these prints? The Frederic Remington Art Museum get calls and emails every day from people who have bought or found a Remington print, usually one of the Collier's prints.The number of inquiries is a compelling indicator that, while we know they were printed in open editions, they must have sold very, very well. Remington's many Collier's images enjoyed varying popularity with Remington's fans. Aside from working in the context of publishing, Remington developed artistic interests and achievements that made him feel increasingly annoyed by the thematic constraints of illustration. In 1895 he began working in clay, producing twenty-two bronze images. He developed skills as a painter that transcended the detail-oriented illustration work. Soon after the turn of the century, he was producing paintings that show no traces of the illustration tradition, and were heavily influenced by his growing interest in American impressionism. His work for Collier's increasingly showed his developing stylistic interests. He embarked on a theme � The Great Explorers Series. Of the nine images, the only public success was Radisson and Groseilliers, a beauty that showcases Remington's increasing interest and success as a painter of the American landscape. Generally, his public was interested in the Old West images of cowboys and Indians they'd long been accustomed to. Now, "sterotype" bears negative connotations. It is defined as: A conventional, formulaic, and oversimplified conception, opinion, or image. A hundred years ago, Remington created a stable of "types" or stereotypes that were understood not to be depictions of actual individuals. Often celebrated as an artist of action, of the figure in landscape, Remington did not often attempt portraiture, and populated his paintings with casts of recurring characters. The print series, "A Bunch of Buckskins," of 1901, published by R. H. Russell names some of denizens of Remington's West: Old Ramon, A Breed, A Sioux Chief, A Cheyenne Buck, An Army Packer, A Cavalry Officer, An Arizona Cowboy, and A Trapper. Throughout Remington's life, he produced work that was done for his own pleasure, not for sale or publication. Much of this was focused on his beloved northern woods and rivers � the landscapes of Northern New York. Remington was born in Canton, New York, and was raised there and in Ogdensburg. Every summer he would return to St. Lawrence County, either to Cranberry Lake in the Adirondack wilderness, or to an island he bought in 1900 and named Ingleneuk, in the Thousand Islands. He loved to fish and canoe, and represented this green and blue landscape in paintings and drawings. By 1904, he was incorporating it into his Collier's work, such as The End of the Day and Radisson and Groseilliers. Remington was receiving one-man shows at exclusive New York galleries, and was rightly proud of his outstanding accomplishments. As Remington developed his painterly technique, he not only lost interest much of his earlier painting practices, he hoped to banish the memory of his earlier work. In many cases, the prints are the only record of paintings. On Friday, February 8, 1907 Remington noted in his diary, "Burned every old canvas in house to day out in the snow. About 75.- and there is nothing left but my landscape studies." It is notable that his pride in his artistic development was so strong and swift that he was burning paintings published as recently as two years earlier. On January 8, 1908 he wrote: "Burned up a lot of old canvases - "New cook [Bringing Home the New Cook] and Apache Water Hole [Shadows at the Water Hole]and Lengthy Shaddows." among them also "Drifting Before Storm". He burned most of the 1906 Great Explorers Series as well. Remington's Collier's prints include some of his proudest achievements as a painter. Employing the prowess he'd already developed in creating paintings en grisaille for illustrations, Remington developed his own mode of nocturnal painting, heavily influenced by his friends, the American impressionist painters. There are 61 Remington nocturnes in all. Some Collier's reproductions here are The Sentinel, The Grass Fire and A Halt in the Wilderness.